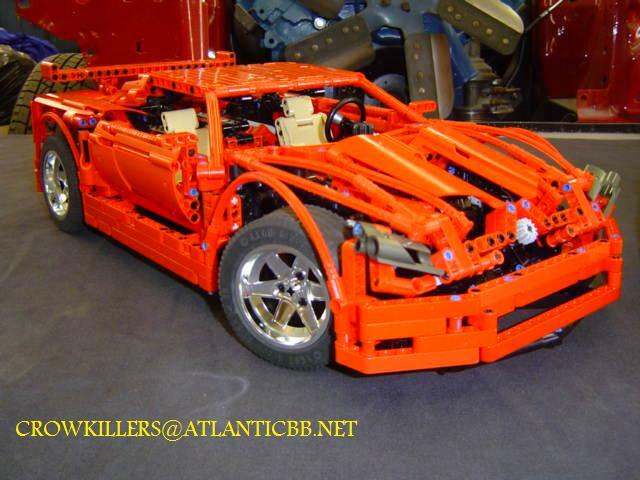 Remember when I first saw the TECHNIC Concept Car from Crowkillers, with its customized chrome plated rims, having wished to get some of them too. These were however according to a note at his BS folder, chromed by request on a US supplier specialized in chrome platting for miniatures and full size automotive interior parts (Chrome Tech USA). This may be a not so practical option for non US costumers, but there is now a new hope for all TECHNIC fans asking for specific custom chrome parts, also in Europe. ChromeBricks.com a new Bricklink store, that I found these days while preparing some new orders. They work with a huge German company, which uses a special industrial procedure to evaporate the bricks with the different metals. Their actual assortment is not so focused in specific parts useful for TECHNIC models/builders, but it already includes some, and some more will come in the future for sure. "43.2mm D. x 26mm TECHNIC racing small wheel" (41896) on the left, and "56mmD. 5 spoke wheel cover from TECHNIC Enzo Ferrari" (50965) on the right. Wish also some of the same Crowkillers customized large 62mm rims (22969), but it seems quite improbable as they are already on short supply, from BrickLink. Hopefully Ansgar (the man behind ChromeBricks.com) should be able to plate some by request, if one agrees with him to send the parts. Notice this could mean a considerable higher price, because of the specific fixture required and the small quantity batch for vapor-deposition in the vacuum chamber. And there is also available a lot of other silver chrome parts, for LEGO fans from different themes (would even say, mainly for them... ). See some fantastic examples below, for the Castle fans. Or this gold helmet, chrome plated with genuine gold. Also a custom version for a plain chrome gold C-3PO, is on its way soon. Leave a comment to this post, about which parts would you most desire to get chrome plated. And lets hope that Ansgar finds enough demand and decides to customize them as well. OH My F*****g God !! !